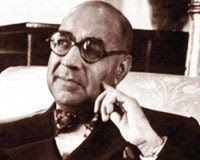 "Pakistan stands firm," said the first premiere of Pakistan in 1950, during his visit to the United States. "It stands firm because the Muslims who form the majority of its eighty million people have an ideology of their own which we call the Islamic way of life." "This is not a new ideology. It is a body of faith, tradition and belief, which has been a part of man’s heritage for over thirteen hundred years. We believe that this ideology when applied to statecraft and the conduct of human affairs is bound to promote human welfare. Let me tell you in a few simple and clear words what it is. "There is first the belief in God and His supreme sovereignty. This does not mean either theocracy or medievalism. We do not believe in priesthood or in the caste system. We consider the first to be unnecessary, for God is as close to one human being as to another. We consider the second to be an abomination, for all men are equal. "Individual effort and enterprise is the law of life with us as well as the belief that each man or woman is entitled to the fruits of his or her honest endeavor. The pivot of our economic doctrine is the right of private ownership but our laws and institutions have behind them the aim of reducing inequalities of wealth. "We believe in democracy, that is to say in the right of people to be governed by their own chosen representatives; in social and economic justice and in equal opportunities for all citizens of whatever race or creed they may be. "We do not have to present this ideology to our people as a new manifesto. The principles I have stated are part and parcel of Islam and when we say that we want to follow the Islamic way of life what we mean is that we could not possibly do otherwise." I have scanned through writings of authors and leaders of Pakistan Movement but am yet to come across a passage which describes so comprehensively in so few words what Pakistan really meant to its founding generation. This is what it means to the masses even today but perhaps the problem is that some of us don’t know that this is the case. Shazia, thanks. Yes, this thinking was institutionalized in the Objectives Resolution passed by the Constituent Assembly in March 1949. It remained, and still is, the immovable cornerstone of all future Pakistani constitutions. Unfortunately the words "God" and "Islam" in that document were not interpreted in the light of the founding fathers' explicit definitions of those terms. Re-read that document in the light of this definition and you might be amazed at what you see! This is an amazing statement. Are two women equal to one man?